The Bible's account of Noah, the ark, and the Genesis flood states that the ark came to rest on the "mountains of rrt" where "rrt" has been translated "Urartu" or later "Ararat" during Armenian times (there are no vowels in the original Hebrew text of "rrt").� From Assyrian texts, Urartu is known to have existed from about the late 13th century BC to the 9th century BC as a loose federation of tribes near Lake Van and the Araxes river, and thus near the traditional Mount Ararat (Agri Dagh). The conservative view of Moses' writing Genesis around 1400 BC is close to the 13th century BC Assyrian king's writing about the Uruatri or Uratri. The inhabitants of Urartu called themselves Biainili while modern literature typically calls them "Urartu" or "Kingdom of Van." The Urartian language is similar to the Hurrian langage, which is shown in proper names of residents in northern Mesopotamia during the third millenium. Dr. Paul Zimansky discusses the origins of Urartu in Ancient Ararat: A Handbook of Urartian Studies, "Inasmuch as Hurrian became increasingly common there as time went on, it is assumed that the number of its speakers was continually being reinforced by migrants from eastern Anatolia, which was then beyond the frontiers of literacy. Since the earliest text in the Hurrian language show features similiar to Urartian which are absent in later Hurrian, the prevailing view is that the two diverged from a common source not long before the time these were written. In recent years, Russsian scholars also suggest that Urartian and Hurrian should be regarded as members of a Northeast Caucasian langage family that also includes several relatively obscure tongues still spoken in the Caucasus. This thesis, which is not universally accepted, would reinforce the notion that Urartian never strayed far from its Transcaucasian birthplace." Russian scholars have also suggested that Urartian has Hurrian and Hittite roots (Diakonoff) although the Hittite comparisons are not overwhelming. Most consider that early Hittite language had a large influence on Hurrian, which in turn had an influence on Urartian. Dr. Paul Zimansky noted, "Urartian art styles and craftsmanship are distinctive and some authorities have seen their influence, transmitted either directly or through west Anatolian and Syrian intermediaries, as far afield as Greece and Etruria." The Urartian texts are in cuneiform borrowed from Assyria, although it is a different language than the Assyrian language. As Zimansky continues, "The textual record, however, like the findings of archaeological research, is approachable only through a thicket of modern languages; Armenian, English, French, German, Italian, Russian, and Turkish are all commonly employed in scholarship in this field... The history of the Assyrians, Medes, and Persians, for example, cannot be written without reference to Urartu... For most of the Twentieth Century, Russian scholars took an interest in Urartu because it was the first state-organized society to emerge on Soviet soil." Zimansky continues: "After it crystalized, the kingdom expanded throughout eastern Anatolia and Transcaucasia with such astonishing rapidity that one suspects the path was cleared for conquest by pre-existing unitites of some sort. Few geographical factors encourage unity in Urartian territory. The fold lines of the Pontic, Taurus, Caucasus, and Zagros Mountains intersect here in such a way as to block potential arteries of communication; there is no central location positioned to tie all of the oases of cultivation together. Urartu's rivers belong to no less than five different watersheds, flowing into the Black Sea, Persian Gulf, the Caspian Sea, Lake Urmia and Lake Van, respectively. Several prominent volcanoes, including the Sahend, Bingol Dag, Suphan Dag, and Ararat add to the geographical complexity of the area, and bear witness to the tectonic instability that still plagues it. Although the Taurus Mountains form a substantial barrier between the lowlands of Assyria and the Anatolian Plateau, for the most part there is no fixed natural boundaries around the perimeter of the state. Climate is another factor that appears to militate against the unification that Urartu so clearly effected. Winters begin early and snow cover is apt to last from October to May." Along with the language similarities to the Hurrians, Urartu also borrowed their spiritual world from the Hittites, Hurrians, and Assyrians, with changes that were definitely Urartian. The most important inscription to understand the Urartian gods is carved in a rock on one flank of Zimzim Dagh at Mhere Kapisi west of Toprakkale. Eighty gods and goddesses are listed in order of importance with Haldi at the head and Teisheba and Siuni as the storm god and sun god, respectively. The Urartian period marks the end of the line for most of these Hurrian gods. Some of the goddesses are also the names of mountains so the Urartians shared that Bronze Age Hittite practice. Provincial leaders were also interred in a lavish manner with rock chamber tombs like at Van cliff as shown at Werachram. 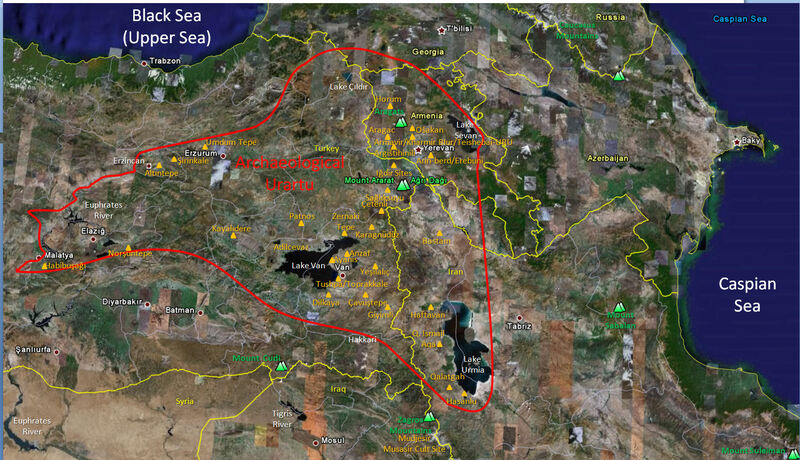 The boundaries of the Urartian kingdom include the Mount Ararat area. However, some alternative locations for the landing place of the ark were proposed many centuries later and are outside Urartu's boundaries. The Urartian Kingdom expanded until it covered a wide geographic area from the 9th century BC until the 6th century BC when it was destroyed by the Medes and vanished from history, only to be rediscovered in the archaeology of the late 1800s and early 1900s.� Thus, post-Mosaic writers may have misinterpreted the location of the Ararat site for the Ark's landfall based on this much larger Urartian Kingdom which was closer in time to them, more well-defined by cuneiform texts, and more familiar than the earliest Urartu confederation of tribes.� Please note that the later and largest Urartu Kingdom includes Mt Cudi, just barely. Even before Urartu, the Mount Ararat region along with the Araxes river valley constitutes a possible starting location for the archaeology of the Early Transcaucasian culture with its distinctive red-black burnished ware. There are a number of Chalcolithic and Early Bronze Age archaeological sites around Mount Ararat in Turkey, Armenia, and Nakchivan. Archaeologists would like to research this area more but the border region is difficult to get permission to research and the borders break up the research area into separate nations. However, ArcImaging was able to secure permission in 2001 for the first archaeological survey of Mount Ararat since the 1980s. The Mount Ararat Archaeological Survey co-authored by Ataturk University Archaeology Professors in Erzurum, Turkey and Rex Geissler of ArcImaging was published in the Summer 2008 Edition of Bible and Spade by Associates for Biblical Research (ABR). For a photo album of Urartu, visit the ArcImaging Urartu Photo Album. The earliest obvious historical reference to the geography surrounding Noah's Ark landing on Mount Ararat is by the early church historian Philostorgius's account around A.D. 425. The 2007 translation of Philostorgius was edited by Philip R. Amidon, originally from Joseph Bidez, except for the extracts from the Syriac chronicles. Amidon emphasizes how Philostorgius made great use of the immense library resources of Constantinople in his writings, which should give us more confidence in his geography. "The learned and fervently Eunomian layman Philostorgius, born in Cappadocia around 368, heartily detested such historiography as may be imagined [this reference is to the Council of Nicaea's Nicene Creed supporters like Rufinus who translated and extended/massaged Eusebius of Caesarea writings into Latin to show support for Nicene Christianity]. The remnants of his writing show a lively intellectual curiosity encouraged by his sectarian creed, whose God is not the hidden deity of Gnosticism but one whose very substance can be known by human reason directed aright. He obviously drank deeply from the libraries, museums, and archives of Constantinople, his Dissimilarian spectacles bringing into focus a picture of the century preceding that was very unlike the one painted by Rufinus, with whom his own narrative, when he came to write it, was indeed in frequent argument... It appeared sometime between 425 and 433, in twelve books bound in two volumes, its proper period the years from 320 to 425... Philostorgius in fact groups into one 'homoousian' party all those Christians who opposed Eunomianism (in the same way as those of Nicene sympathies like to call 'Arian' anyone who rejected the term 'consubstantial' as used in the Creed of Nicaea)... Such is the central dram of our author's history: the enduring contest between the true monotheistic faith of God's people and the pagan forces arrayed against it. Gnosticism is always the silent partner in the debates between Nicene and Eunomian Christians, the real foe against whom Aetius fought the battle that nearly led to his death. And there is some evidence that this view comes from Eunomius himself. This being the tenor of Philostorgius's history, it is not surprising that the government that championed the Nicene faith would seek to suppress it, seeing that it had previously ordered the burning of the works of Eunomius, one of the great heroes of his tale... He followed Herodotus's lead in historiography, embroidering his narrative with learned excursions into geography and natural history and in general cultivating style that would recommend him to his readers. The style was no empty show. His immersion in the scholarly resources offered by Constantinople has preserved for us, even in the abridgement of its original work, traditions that are otherwise unknown or that add perspective to matters related elsewhere." "The Persian Gulf, which is formed by the ocean as it enters there, is huge and is encircled by many nations. The Tigris is one fo the enormous rivers that empty their streams into it at its mouth. The Tigris seems to have its source in the east, south of the Caspian Sea in Corduena, and it flows past Syria, but when it arrives in the region of Susa, the Euphrates joins its current to it, and so it boils onward, swollen now to a great size. Hence they say it is called "Tigris" after the animal. But before it descends to the sea, it divides into two great rivers, and then it empties into the Persian Gulf from these two mouths at its end, which are divided from each other. It thus cuts off a considerable area of ground in between, making of it an island that is both of the river and of the sea; it is inhabited by a people called the Mesenes. As for the Euphrates River, it appears to take its rise in Armenia, where Mount Ararat is. The mountain is still called by that name by the Armenians. It is where, according to scripture, the ark came to rest, and they say that considerable remnants of its wood and nails are still preserved there. From there the Euphrates starts as a small stream at first, growing ever larger as it advances and sharing its name with the many rivers that empty into it. It makes its way through Greater and Lesser Armenian and then proceeds on, dividing first the Syria that is properly called Euphratensis and then also the rest of Syria. Having passed through this region, and the remaining part [of Syria], and having broken up the lands through which it passes into a series of convolutions of every sort with its crooked course, it draws near to Arabia. There its way takes it in a circle opposite the Red Sea as it loops around a wide region, after which it turns toward the Caecias wind, midway between north and east. It then heads toward the Tigris River, although it cannot join its whole self to it, but wasting part of itself on the way, it empties the remained of itself into the Tigris quite near Susa, this remainder being a mighty stream quite capable of carrying ships. There it also abandons its name and flows with the Tigris down to the Persian Gulf. The land between these two rivers, the Tigris and Euphrates, is called Mesopotamia." 1) Read the Urartu and Noah's Ark search overview. 2) Read the Urartu/Ararat Boundaries. 3) Read the Search for Noah's Ark Online Presentation. 4) Read the Mount Ararat Archaeological Survey. 5) Read the Mount Ararat Geological Survey. 6) Read the Durupinar geologic overview, The Formation and Mechanics of the Great Telceker Earth Flow by Turkish Geologist Murat Avci. 7) Read the classic Noah's Ark search book with hundreds of photos, The Explorers of Ararat: And the Search for Noah's Ark. The 2nd Edition was available in a printed version but the 3rd Edition is published for free online. Great Commission Illustrated (GCI) Books initially published The Explorers of Ararat book in May of 1999 with 482 pages and 265 photographs, which was initiated by B.J. Corbin, authored by numerous expedition leaders, a great historical reference section with both pros and cons of alleged eyewitnesses, and edited by Rex Geissler. Though there have been many claims of a discovery of Noah's Ark in ancient documents and recent books/films, there is no scientific proof, public photograph, or evidence of the survival or existence of Noah's Ark. However, there are hundreds of cultures around the world that make reference to the flood and Noah's Ark, but most researchers focus the search within the biblical mountains of Ararat/Urartu as stated in the Genesis account. Within this region there are four primary areas of interest, Mount Ararat, Mount Cudi, Durupinar, and Iran. The LORD saw how great man's wickedness on the earth had become, and that every inclination of the thoughts of his heart was only evil all the time. The LORD was grieved that he had made man on the earth, and his heart was filled with pain. So the LORD said, "I will wipe mankind, whom I have created, from the face of the earth�men and animals, and creatures that move along the ground, and birds of the air�for I am grieved that I have made them." But Noah found favor in the eyes of the LORD. This is the account of Noah. Noah was a righteous man, blameless among the people of his time, and he walked with God. Noah had three sons: Shem, Ham and Japheth. Now the earth was corrupt in God's sight and was full of violence. God saw how corrupt the earth had become, for all the people on earth had corrupted their ways. So God said to Noah, "I am going to put an end to all people, for the earth is filled with violence because of them. I am surely going to destroy both them and the earth. So make yourself an ark of cypress wood; make rooms in it and coat it with pitch inside and out. This is how you are to build it: The ark is to be 450 feet long, 75 feet wide and 45 feet high. Make a roof for it and finish the ark to within 18 inches of the top. Put a door in the side of the ark and make lower, middle and upper decks. I am going to bring floodwaters on the earth to destroy all life under the heavens, every creature that has the breath of life in it. Everything on earth will perish. But I will establish my covenant with you, and you will enter the ark�you and your sons and your wife and your sons' wives with you. You are to bring into the ark two of all living creatures, male and female, to keep them alive with you. Two of every kind of bird, of every kind of animal and of every kind of creature that moves along the ground will come to you to be kept alive. You are to take every kind of food that is to be eaten and store it away as food for you and for them." On that very day Noah and his sons, Shem, Ham and Japheth, together with his wife and the wives of his three sons, entered the ark. They had with them every wild animal according to its kind, all livestock according to their kinds, every creature that moves along the ground according to its kind and every bird according to its kind, everything with wings. Pairs of all creatures that have the breath of life in them came to Noah and entered the ark. 16 The animals going in were male and female of every living thing, as God had commanded Noah. Then the LORD shut him in. For forty days the flood kept coming on the earth, and as the waters increased they lifted the ark high above the earth. The waters rose and increased greatly on the earth, and the ark floated on the surface of the water. They rose greatly on the earth, and all the high mountains under the entire heavens were covered. The waters rose and covered the mountains to a depth of more than twenty feet. Every living thing that moved on the earth perished�birds, livestock, wild animals, all the creatures that swarm over the earth, and all mankind. Everything on dry land that had the breath of life in its nostrils died. Every living thing on the face of the earth was wiped out; men and animals and the creatures that move along the ground and the birds of the air were wiped from the earth. Only Noah was left, and those with him in the ark. Then God said to Noah, "Come out of the ark, you and your wife and your sons and their wives. Bring out every kind of living creature that is with you�the birds, the animals, and all the creatures that move along the ground�so they can multiply on the earth and be fruitful and increase in number upon it." So Noah came out, together with his sons and his wife and his sons' wives. All the animals and all the creatures that move along the ground and all the birds�everything that moves on the earth�came out of the ark, one kind after another. Then Noah built an altar to the LORD and, taking some of all the clean animals and clean birds, he sacrificed burnt offerings on it. The LORD smelled the pleasing aroma and said in his heart: "Never again will I curse the ground because of man, even though every inclination of his heart is evil from childhood. And never again will I destroy all living creatures, as I have done.